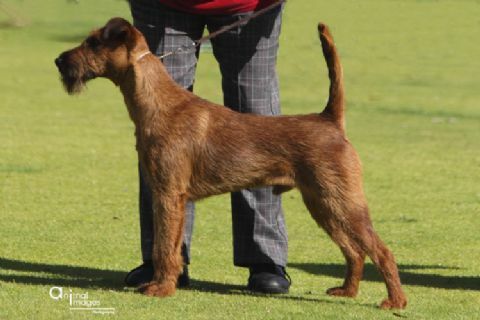 The Irish Terrier is a medium sized dog standing at about 48-50 cm high (i.e.19-20 inches) at the wither. He weighs about 14 - 16 kgs when in good condition. He has a harsh red outer coat and a softer finer undercoat which is easy to maintain with a little hand plucking (stripping) of the hair to keep him neat and tidy. He does not grow masses of hair on his legs like some of the other Terrier breeds. It makes him very easy for owners to keep him looking good without spending a lot of time and money on having a groomer do the job. He can also be easily clipped about 3 times a year at the most to keep him looking neat and tidy. He is a hardy breed of sound body and mind. We are lucky that over the years the breeders have been very mindful of keeping this breed as sound as possible and free of a lot of the problems which plague other breeds such as hip displasia, eye problems etc. No big vet bills unless by accident! He is a dog who loves to play and romp with children and has a strong instinct to protect the family when needed. He is a Terrier though and therefore can sometime become deaf when in the park and instead of coming to his owner when called goes the other way because something has attracted his attention. This is not to say that he cannot be trained to be obedient and perform at such activities as jumping and agility. As can be seen from this website he can be trained to a very high standard and achieve high accolades. Training from puppyhood is a must and we always suggest that new owners book into a puppy training class usually run by the local vet. Irish Terriers have been known to live as long as 16 - 17 years but it is more likely to be around 13- 14 years. They love to be with their family and are as capable of living outside in a kennel as much as inside on the lounge and/or bed. He can be kept quite clean with brushing with only needing a bath when absolutely necessary and I suggest that if you want to bath him often, once a fortnight is enough. He loves going on walks with the family and travels well in the car. He is a dog full of character and humor and a lot of his body poses and antics keep you laughing. If you think that the Irish Terrier is for you please do not heistate to contact me.